To learn more about training offerings, pricing and FREE consultations please check out the Services page. Or contact me directly to chat: Train with Maggie! Recently, I’ve been honored to be interviewed by Shape Magazine, Spark People, MyFitnessPal and Prevention Magazine! Below are the two articles that have already hit the press. More to come. Please feel free to take a look, learn a little, and become inspired for your new, *HEALTHY*, and inspired year ahead! That’s why many fitness professionals, social media influencers, and regular exercisers are focusing on something called body recomposition (“recomp”) instead of simply trying to lose weight. After all, body recomposition is the phenomenon behind many those side-by-side transformation photos that have become so popular on social media. But just because you see something all over the internet doesn’t necessarily mean it’s a good idea. That’s why we talked to experts in the field to find out why the focus on body composition over weight loss is on the rise—and importantly, is this way of training right for you? You’re eating more of the right foods than the wrong ones. You’re getting plenty of cardio, whether it’s walking at lunch, running on the treadmill or sweating it out at spin class. But you’re still not seeing the results you want in terms of weight loss and body composition. You keep hearing how strength training is the key, the missing puzzle piece that will help you burn more calories, build muscle definition and even boost your heart health, mood and bone density. But the idea of lifting heavy weights or navigating those complicated-looking machines at the gym scares you a little—okay, maybe more than a little. The good news? You can start an easy and effective strength training regimen without touching a single weight. At first glance, it might not seem like there’s much to a resistance band. Some of them are stretchy, tube-like cables with handles on both ends, and other versions are wide, flat bands in the shape of a circle.. Can you really get an effective, full-body workout with a single piece of stretchy rubber? The short answer: Yes! Instead of relying on heavy, cumbersome weights, resistance bands use your own body weight to create resistance. They also allow you to perform more precise movements that target specific muscle groups that are difficult to work with weights. Plus, because you have to work harder to maintain balance and stability when exercising with a band, you’ll use more muscles than you would on a traditional machine. As an added bonus, resistance bands are practically weightless and perfectly portable. You can easily toss a band in your briefcase or suitcase, making on-the-go workouts a breeze. They’re even affordable enough to keep one at home, one in your gym bag and one at the office. Although all bands look alike, the various colors indicate different levels of difficulty. Bands are available in various tension levels, with some colors more difficult than others. Ready to hop on the BANDwagon? 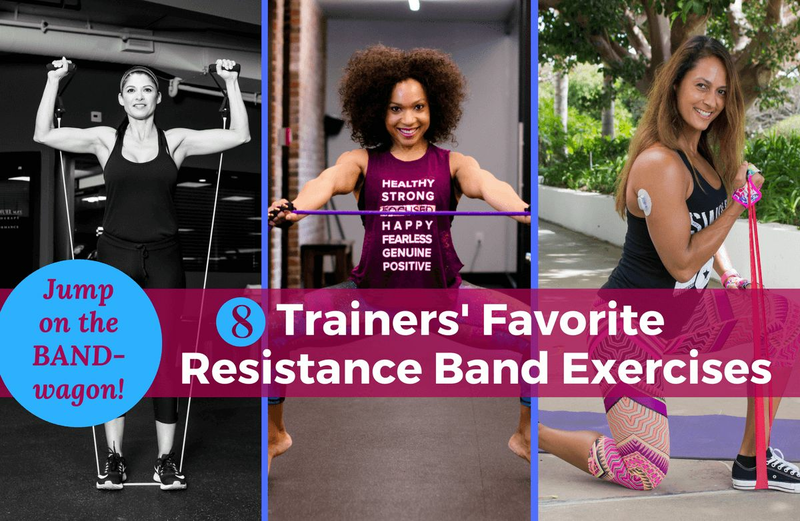 To help you get started, we asked some trainers to share their favorite resistance band exercises. Okay, if you’ve made it to here, I’m impressed (ESP if you clicked through to read the articles – woo!). So, HAPPY NEW YEAR! And one last shameless plug – if you’re even just slightly curious about what benefits you would gain from a single session (or several) with me, then check out my Services page: Train with Maggie! This entry was posted in Fitness and tagged Fitness, free consultation, media, personal trainer, prenatal and postpartum exercise, race training, services, testimonials, wellness coaching, women's fitness on January 3, 2018 by wellnesswinz.